Slider phones are becoming a common phenomenon now. Several smartphone makers are launching phones with a slider in the front with an earpiece, selfie cameras, and sensors embedded into it. Lenovo also joins the bandwagon and launches its first ever slider phone. 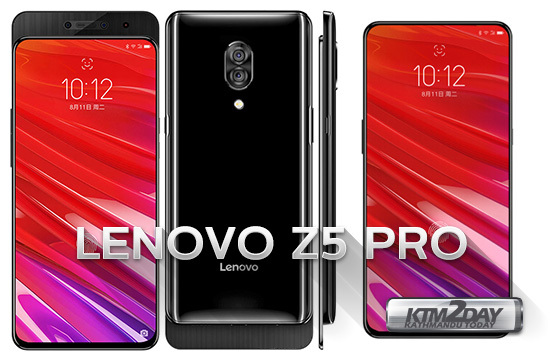 It is the long-time rumoured Lenovo Z5 Pro. Lenovo has launched the advanced version of the Z5 on Thursday in China for a starting price tag of 1,998 Yuan which translates to around NRs 34,000 approx. As of now, there’s no word if Lenovo will bring the Z5 Pro in Indian sub-continent or not. Considering Lenovo has been extremely quiet for some time now, chances are the Lenovo Z5 Pro will not hit the Indian stores anytime soon. As noted, the sliding camera is the new common now. It all started with the Vivo NEX, and the Oppo Find X, Xiaomi Mi Mix 3 and recently the Honor Magic 2 followed the trend. Besides the front slider, the Lenovo Z5 Pro comes with some more interesting features like 4 cameras – two on the front and two on the back, Snapdragon 710 processor, in-display fingerprint sensor and so much more. As far as the specs are concerned, the Lenovo Z5 Pro sports a big 6.39-inch Super AMOLED display which is said to be developed by Samsung. The phone supports Full HD+ resolution of 2340 x 1080 pixels and comes with a screen-to-body ratio of 95.06 per cent and an aspect ratio of 19.5:9. As far as the overall design of the phone is concerned, the Lenovo phone looks a lot like the Honor Magic 2 from the front. The back panel of the Lenovo Z5 Pro is made of glass with well curved from all four sides. 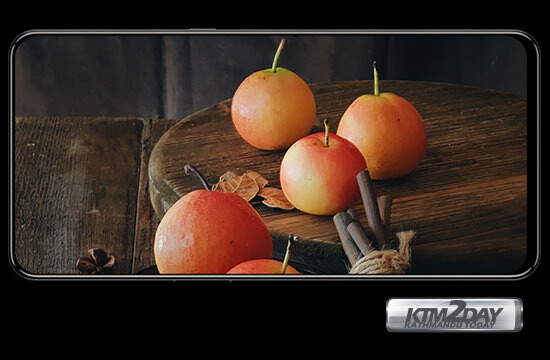 The Z5 Pro comes with slimmer bezels, comparatively the chin of the phone is slightly thicker than the other three sides of the phone. Following the trend, the Lenovo phone also equips an in-display fingerprint sensor. 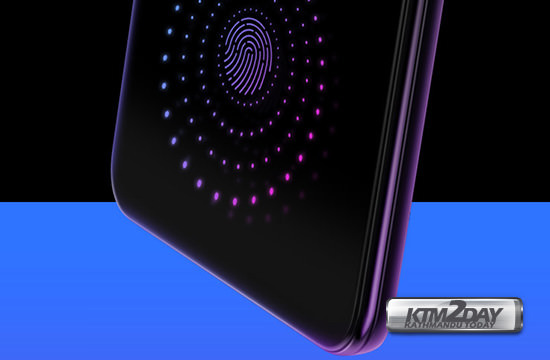 The phone is said to include the fifth-generation photo-electric under-display fingerprint sensor to let users unlock the phone in the blink of an eye. This is also the first Lenovo phone to pack Qualcomm’s recently announced Snapdragon 710 chipset. The smartphone has been launched in two variants – the base model with 6GB RAM and 64GB of internal storage, while the top end model of the phone packs 6GB of RAM and 128GB of internal storage. There’s no way to expand the storage of the phone. On the software front, the Z5 Pro runs ZUI 10.0 based Android Oreo OS, there’s no word if the phone will be upgraded to Pie anytime soon or not. One of the key highlights of the Lenovo Z5 Pro is the camera system. In total, the phone packs four cameras. On the rear panel, there’s a primary camera of 24-megapixel Sony IMX576 sensor while the secondary camera includes 16-megapixel Sony IMX519 sensor. The back cameras of the Z5 Pro pairs with features like dual f/1.8 aperture lens, autofocus, dual-tone LED flash, there’s also 4K video shooting, HDR, PDAF, AI scene recognition and super night scene mode. 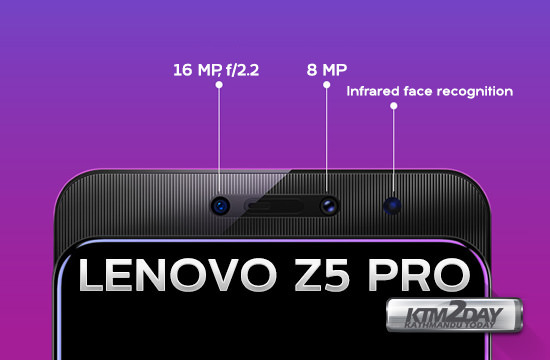 On the front, the Lenovo Z5 Pro packs a primary camera of 16-megapixel and second one is an 8-megapixel infrared camera with an f/2.2 aperture. The dual selfie cameras come paired with lots of AI, beauty mode, and it also supports IR face recognition for quickly and securely recognizing the face of the user to unlock the phone even in low-light situations. The IR face unlock is also found in the V11 Pro. Sadly, the Lenovo Z5 Pro ditches the 3.5mm headphone jack, and which is why the phone comes bundled with Lenovo Air wireless Bluetooth headset. The smartphone comes with 18W fast charging support and packs a 3,350mAh battery. The Lenovo Z5 Pro has been launched in China for a starting price of 1,998 Yuan (roughly Rs 21,000). This price is for the 6GB RAM and 64GB storage model. Meanwhile, the 6GB RAM + 128GB storage variant comes for 2,998 Yuan which roughly translates to NRs 50,600. The smartphone comes in only single colour variant — black.